I very much enjoyed reading Johann Conrad Döhla's diary of his experiences as a soldier in the Anabach-Bayreuth Regiment. I am grateful to Jill Foley for giving me this book. Several such diaries have been translated for us, but I understand that his is the most extensive. [Here is a copy of the shorter Popp diary.] Döhla gives a day by day account of what the life of a soldier was like. It is a primary historical document of incalculable value. For all of you who have an interest in this part of the old family history, I strongly recommend that you read it. It is available through amazon.com or can ordered by your local book store. For every Hasselbacher/Hazelbaker I know who has read it, it provides a classic "ah-ha" moment. It gives the background that places a sentimental story of Peter Hasselbacher hiding in a barn, into a historical setting that makes the whole tale absolutely plausible, if not inevitable! 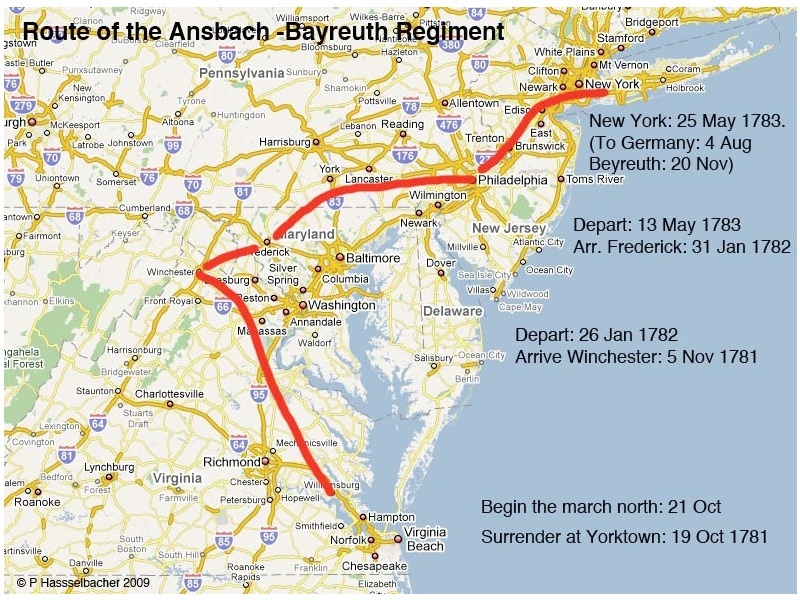 For the purposes of this article, I have focused on the activities of the Regiment following its capture at Yorktown, Virginia. It is possible to construct a timeline of where the regiment was, and even better, the circumstances under which they lived for the next year or so. 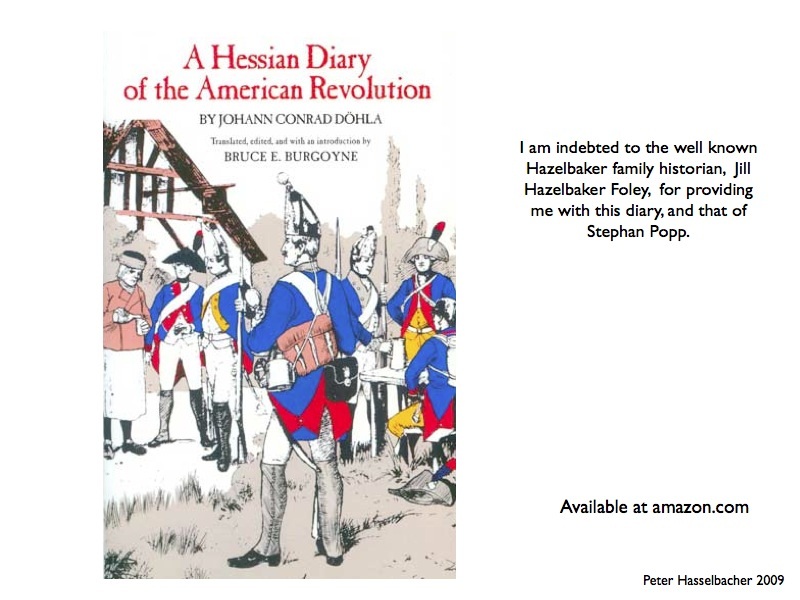 Even the casual reader cannot but see that Peter Hasselbacher was in exactly the right place, at exactly the right time, and under the right circumstances to have met and married Elisabeth Shively to found the large Hazelbaker dynasty! I place links to several slides from a recent presentation into these pages. The entire set of slides is available here. This map sets out the high-points of the march of the Regiment into its detention. For 16 months they were imprisoned under varying states of rigor. Döhla describes their march through a series of towns. I cannot find all of the above towns on modern maps. 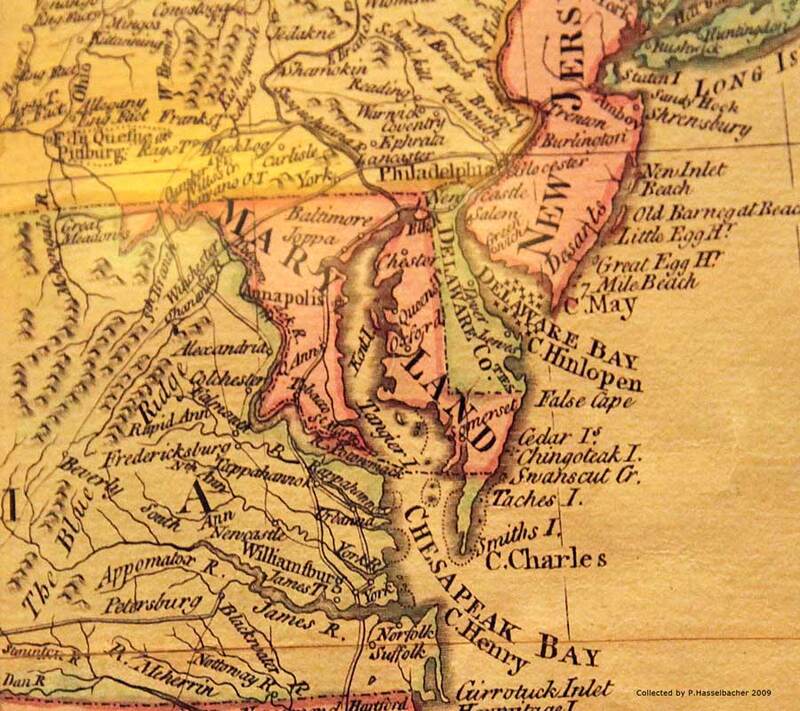 There is still a Hanover County and traces of that name, but I cannot find anything about Germantown. Neither could I find a Newcastle on a modern map. Of interest, on a recent trip to Washington, I snapped an elicit photo of an old revolutionary war-era map in the Library of Congress. Newcastle is there big-and-bold. Mark and Craig Hazelbaker have suggested that many of the old towns of the south were destroyed in the Civil War. I will leave it to history experts to tell us what happened but I am struck with the parallels between our own destructive war and the 30 Years War of Europe that altered the path of our oldest known ancestors. Under such circumstances, with both local and Federal inducements to stay, it is not surprising that many unattached German youth would choose to stay in America. I brought out my old pregnancy time wheel. 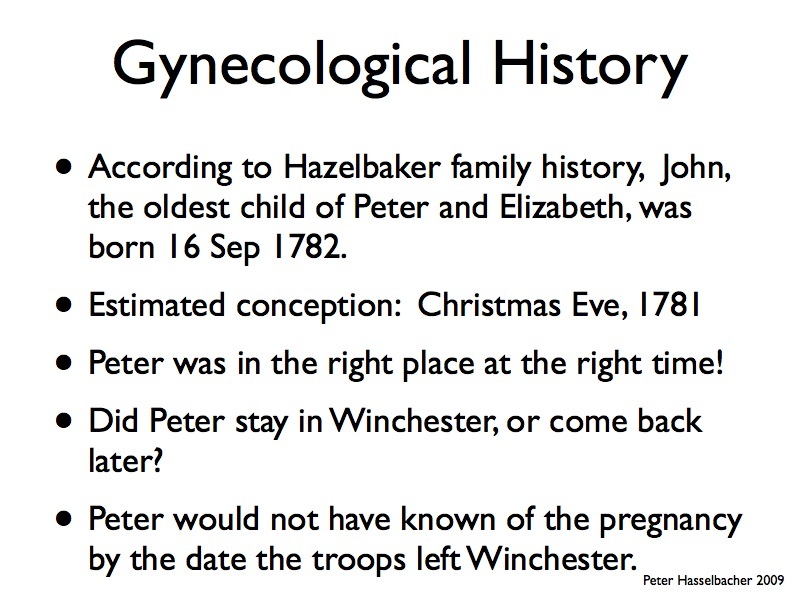 Given that Peter's oldest son John was born 16 Sept 1782, the expected date of his conception would have been Christmas Eve, 1781, exactly when Peter was in Winchester. Thanks to the research of Imogene Sawvell Davis, we know that Elisabeth Shively's father had owned land in Winchester. It is impossible not to put two and two together. 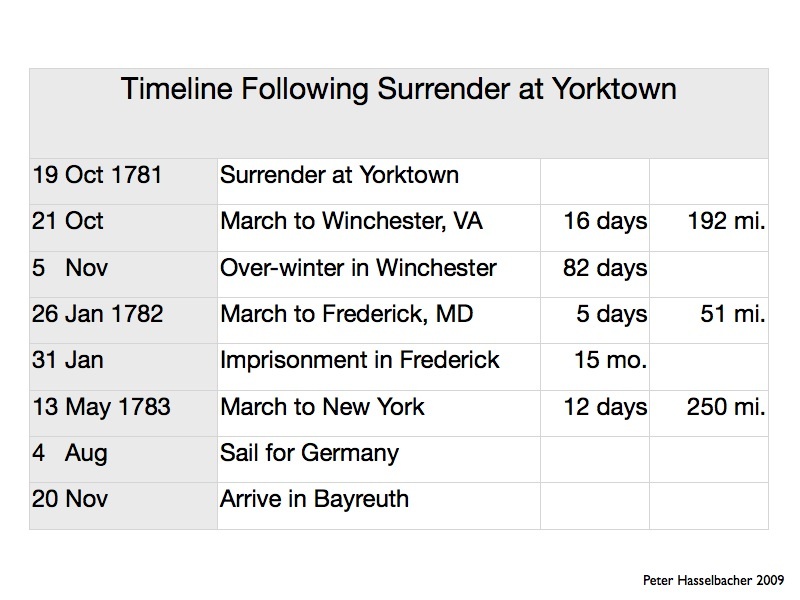 I do not know how Peter ended in Berkeley County VA, or Washington County PA, but I do not believe he moved on with the rest of his Regiment to imprisonment in Fredericksburg, MD. I am leaving that mystery to the Hazelbaker clan! I am willing to bet that the last facts have not yet been found.